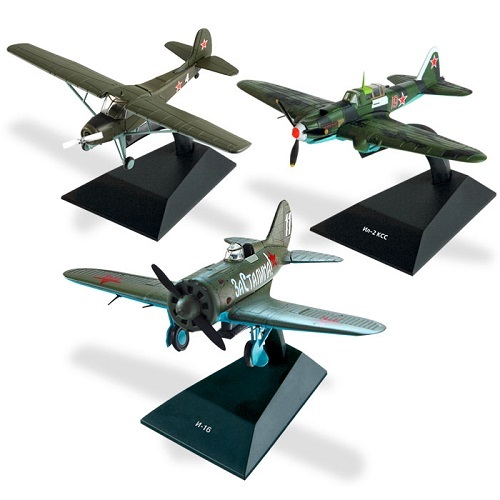 These multi-scale, die cast bombers, fighters and other aircraft are packaged in a blister pack. Each features clear cockpit windows, machine gun turrets and rotating propellers (where applicable), authentic markings, a display stand, and more. One of the nice things about our new site is that it now allows us to highlight some of the more noteworthy items being released by each manufacturer. In the case of DeAgostini, what follows is a list of some of the more intriguing products that are scheduled to come out shortly which we feel would be of interest to the savvy collector. When it flew for the first time in December 1933, the tiny I-16 was far ahead of any other fighter design in the world, thanks to its retractable landing gear, cantilever wing and variable pitch propeller. Soviet research and development of rocket-powered aircraft began with Sergey Korolev's GIRD-6 project in 1932. His interest in stratospheric flight was also shared by Marshal Mikhail Tukhachevsky who supported this early work. The Ilyushin-2 Shturmovik ground-attack aircraft was one of the most important Soviet combat aircraft of World War II. While Russian technology is not always highly regarded in the West, the Il-2 was well-designed and highly effective at its task, was produced in great quantity, and was one of the great combat aircraft of war. The Yakovlev Yak-12 (NATO reporting name: "Creek") is a light multirole STOL aircraft used by the Soviet Air Force, Soviet civilian aviation and other countries from 1947 onwards. The Yakovlev Yak-11 (NATO reporting name: "Moose") was a trainer aircraft used by the Soviet Air Force and other Soviet-influenced air forces from 1947 until 1962.